This page follows the format adopted for the JASDF base histories that are likewise being gradually compiled and expanded. Steeped in aviation history that in some cases pre-dates the service’s formation, JMSDF air bases are inextricably linked to the development of aviation in Japan. This page will provide comprehensive information on the key events and operations that have happened in the history of 14 of the service’s major air bases. The bases highlighted in the following table have been included as examples. Completed as an Imperial Japanese Naval Air Force base in June 1930 and now the JMSDF’s largest helicopter base, Tateyama in Chiba Prefecture (seen below) is targeted for particular attention. As a temporary measure, some basic information is provided below in directory form. The setting for U.S. Army Gen. Douglas MacArthur’s famous arrival on vanquished Japanese soil on August 30, 1945, Atsugi’s long career as a U.S. Navy base commenced in December 1950. Initially conceived as an IJNAF training airfield for carrier-based aircraft crews—a role Atsugi has coincidentally fulfilled since October 1973 as a shore-base for U.S. Navy carrier fighter squadrons—funding to cover the costs of such a facility was set aside in 1938. Submitted by the Ministry of the Navy on December 23, 1939, a request bearing the name Atsugi was selected over two other candidates, in Izumi, Kagoshima Prefecture, and Kochi City, Kochi Prefecture. At the time, it was envisaged that 58 carrier-borne bombers and 28 reconnaissance aircraft would be stationed at the base. In its later years, the airfield’s proximity to Tokyo naturally dictated that it become heavily involved in the front line of homeland defence operations right up to the end of the war. The original base was located around six miles (10 km) from what was then the town of Atsugi. A number of theories have been put forward as to why the name was chosen, the most popular being as a ruse to deceive any potential enemies, but there were many cases where a base was given a name different from that of its true location. Whereas the Imperial Japanese Navy had systems in place for the naming of ships and aircraft, a method for naming its bases did not come into effect until September 18, 1943. Prior to that time, the practice was to use names that would be nationally recognized. As the site straddled several villages, there were a number of options. Some of the village names, however, were more closely associated with other parts of Japan; Ayase was possibly thought too close to that of the Japanese battleship Hatsuse, which was sunk by mines during the Russo-Japanese War of 1904–5. Although the name of a bay as well as a local place name, Sagami had unfortunately already been taken for an IJAAF airfield that was then under construction. Reflecting a shortage of pilots and the deteriorating war situation, the 60-aircraft Atsugi (later 203rd) Naval Air Group was formed at Atsugi under the 11th Air Fleet on April 1, 1943. Emblematic of the base’s combat operations was the composite 302nd Naval Air Group, the 1st Squadron of which at its peak flew more than 40 Mitsubishi J2M (Jack) interceptors. Formed on February 20, 1944, at Kisarazu, Chiba Prefecture, the squadron moved to Atsugi to commence training on March 30, 1944, the day the 203rd formed and relocated to Chitose air base in Hokkaido. Starting on August 16, 1945, the day after Emperor Hirohito’s pre-recorded radio broadcast had announced Japan’s capitulation, there took place what became known in the Japanese press as the Atsugi Naval Air Group Incident. Refusing to accept the surrender, a total of 83 members of the 302nd Naval Air Group under the command of Capt. Yasuno Kozono (1902–60) staged a revolt, while attempting to exhort local people to support them by dropping leaflets from their aircraft. A telephone appeal made by the Emperor’s brother, Prince Takamatsu (1905–87), did nothing to dissuade a reported 33 of the 302nd’s pilots from taking off on August 19 and heading for IJAAF bases in Saitama Prefecture in an ultimately unsuccessful bid to rally other units to their cause. Having held the base at Atsugi captive for nine days, the remnants finally gave themselves up on August 25. The first Allied personnel to make landfall at Atsugi was a 148-strong advance party under Col. Charles Tench arrived three days later, two days ahead of MacArthur. Acting as a sub-base for Shimofusa in Chiba Prefecture, the JMSDF area of the base witnessed the forming of the first Atsugi detachments on December 24, 1971, to officially start in earnest joint U.S.-Japan operations. Atsugi was elevated to full base standard in October 1973 and became the home of the Fleet Air Force Headquarters, also relocated from Shimofusa, two months later. New dimensions were added to JMSDF operations in 1981. 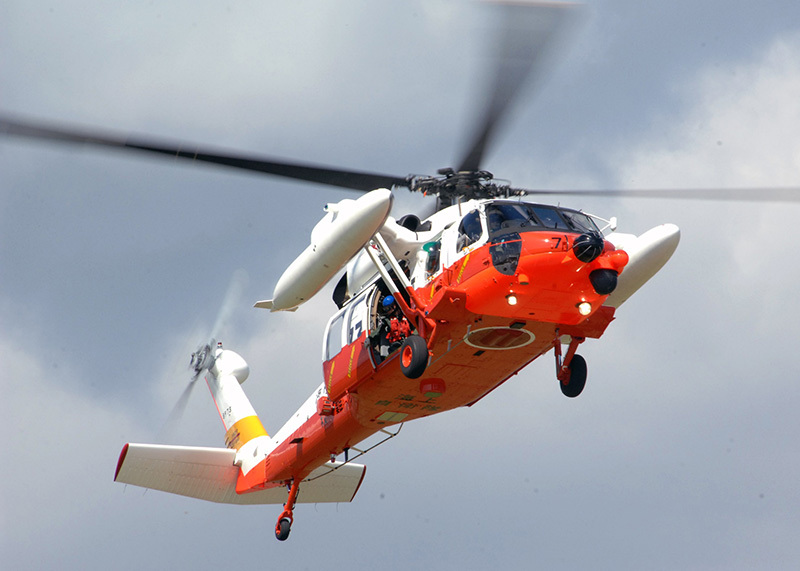 Firstly, a detachment from the Iwakuni-based 71st Kōkūtai was formed at Atsugi to provide search and rescue (SAR) cover with a single ShinMaywa US-1 amphibian that July. Three months later saw the arrival from Shimofusa of the 51st Kōkūtai, the JMSDF’s test and evaluation squadron. On March 30, 1983, the forming of the JMSDF’s first P-3C squadron, the 6th Kōkūtai, under the 4th Fleet Air Wing started Atsugi’s long association with the Orion. The base is destined to become the first to conduct operational squadron-level P-1 operations in the autumn of 2015. Two aerial photos of Atsugi, taken 20 years apart; (above) as the base appeared in 1988, (below) from an ANA flight en route to Matsuyama, Ehime Prefecture, in March 2008. In December 2013, a civil contractor working on a construction site on the U.S. (east) side of the air base stumbled upon an aircraft shelter from Atsugi’s time as an IJNAF base. Inside the bunker was part of the starboard wing leading-edge slat from a Nakajima J1N Gekko (Irving) night fighter, another type operated by the 302nd Naval Air Group. The plan was to place the relic on display at the base terminal building. (*) Not to be confused with nearby Sagamiono station on the Odakyu Line. The first utilization of the airfield at Hachinohe, construction of which had started in 1939, was as a training facility for young Imperial Japanese Army Air Force (IJAAF) pilot recruits. Having only been completed and commenced operations in 1941, the base area was expanded during its time as U.S. Army Camp Haugen under the postwar Allied Occupation from August 1945. As a result of the redeployment of U.S. forces following the outbreak of the Korean War in 1950, a National Police Reserve camp was established on the site that September, though the resident unit was to be relocated to Kanazawa, Ishikawa Prefecture, in April 1951. Having come under National Safety Force control from October 1952, the facilities became JGSDF Hachinohe Army Camp upon the withdrawal of U.S. units and the base’s return to the Japanese government on May 17, 1956. It was on March 9, 1957, that offices were set up for 67 staff members in preparation for an adjacent JMSDF presence on the base, which officially started on March 16 with the forming (recorded here [link]) of the Grumman TBM Avenger-equipped Hachinohe Kōkūtai (Air Corps) that reported to the then regional Ohminato Chihōtai (Naval District). Having assumed command of the 2nd Hikōtai (Squadron [link]) in 1958, the Hachinohe Kōkūtai was reorganized as the 2nd Kōkūgun (Fleet Air Wing) under the centralized Kōkūshūdan (Fleet Air Group) on September 1, 1961. The base added the 4th Kōkūtai in 1963. Having exchanged the Avengers for Lockheed P2V-7 Neptunes in 1958, Hachinohe received its first Kawasaki P-2J Turbo-Neptunes in 1971 and Kawasaki-built Lockheed P-3C Orions in 1985. The base was briefly home to the 51st Kōkūtai, the JMSDF’s aircraft test and evaluation unit, from its formation as a result of the reorganization on September 1, 1961, to its relocation to Shimofusa, Chiba Prefecture, in March 1963. Commencing in 1963, when the Provisional Hachinohe Detachment was formed, there was also a JASDF presence at the base that was to remain until 1972. For safety reasons, joint civil and U.S. military operations were ceased at Misawa in 1965. This move prompted the transfer of civil operations to Hachinohe until Misawa commercial services resumed in 1975. (Above) Hachinohe Air Station as it looked from the air 40 years ago, in 1975. On March 23, 1999, a Hachinohe-based aircraft made the first sightings of two suspicious vessels off the northwest coast of the Japanese mainland island of Honshu. The sightings set in motion a chain of events that culminated several hours later in JMSDF and Japan Coast Guard vessels firing warning shots. Referred to in the Japanese press as the Noto Peninsula Incident, this first major maritime security operation had lasting ramifications, having revealed certain shortcomings—particularly in terms of the rules of engagement—that on this occasion had allowed North Korean vessels disguised as Japanese trawlers to make good their escape. On March 25, 2008, further reorganization of the flying units resulted in the two P-3C units merging into one; both were disbanded, the 2nd Kōkūtai reforming as the surviving entity. First formed on December 1, 1960 [link], the resident air rescue squadron kept pace with the equipment changes over the years, receiving its first UH-60J [link] rescue helicopter in 1994. As a result of the reorganization of March 2008, however, the base’s UH-60Js were moved to Ohminato. The control tower currently in operation at Hachinohe was completed in 1998. As the northernmost fixed-wing patrol unit, Hachinohe’s 2nd Fleet Air Wing has to conduct safe operations in the harshest winter weather conditions. Its mission responsibilities can broadly be divided into four categories: maritime patrol/surveillance; disaster relief; cooperation with civilian organizations; and overseas deployments. The 2nd’s home-based operational zone extends upwards from the northernmost tip of the Noto Peninsula on the west coast, includes Hokkaido and the northernmost Japanese islands, and extends down the eastern coastline as far as the south of Fukushima Prefecture. In 2012, the innovative issue of a set of commemorative stamps was included in the promotional activities marking Hachinohe Air Station’s 55th anniversary. Recent achievements have included commencing, on January 23, 2015, the latest series of flights on behalf of the Japan Meteorological Agency that monitor the ice floes primarily in the Sea of Okhotsk. Having reached the 1,000 mark in 2001, the last mission of 2015, carried out on April 3, was the 1,089th of its kind conducted by the JMSDF since 1960. Early in May 2014, two P-3Cs and a 130-strong support team were sent to Djibouti in East Africa to join an international force engaged in measures to counter the threat to shipping in the area from pirates. The last Hachinohe elements returned to base on June 19 of that year. The 2nd Fleet Air Wing has been involved in four of the 18 deployments since the counter piracy operations commenced in May 2009. The latest Djibouti deployment was quickly followed by the sending of another pair of aircraft and around 40 support personnel to Australia in August 2014 to take part in a multinational anti-submarine training exercise. On the home front, the annual air show at Hachinohe naturally plays a key role in the base’s annual programme of community relations events. The Kawasaki P-1 made its debut at the September 2014 event, which was blessed with good weather and thus attracted around 7,000 people, roughly double the normal number. (*) A short video ([link]) on the asahi.com news site includes footage of the Hachinohe ceremony on January 6, 2015. The accompanying article mentions that Rear Admiral Tomohiko Madono, the commander of the 2nd Fleet Air Wing, gave the New Year briefing in front of around 100 unit personnel. The first flight involved three P-3Cs engaging in formation flight training while proceeding along the coast from Hachinohe to Kuji in Iwate Prefecture. Accompanied by the usual music soundtrack preferred for promo videos, another short film giving a glimpse of daily life at Hachinohe can be found on YouTube here [link]. On May 3, 2015, the first-ever jointly organized Friendship Day airshow event was held at Iwakuni air base, which is shared by both the JMSDF and the U.S. Marine Corps under the latter’s control (as Iwakuni Marine Corps Air Station[ MCAS], the name first adopted on July 20, 1952). The event fell four months short of the 70th anniversary of the first arrival of Marine Corps units there in September 1945. Its military government responsibilities and the sheer size of its contingent resulted in the United States being most closely associated with the ensuing period of Allied Occupation. From February 21, 1946, until the end of the Occupation in April 1, 1952, however, Iwakuni fell within the area assigned to the British Commonwealth Occupation Force (BCOF), comprising elements from Australia, India and New Zealand as well as Britain. Roughly a quarter of the size of the U.S. presence in Japan, the BCOF controlled the Chugoku region, encompassing the five prefectures from Tottori and Okayama in the east to Yamaguchi in the west, and the four prefectures on the island of Shikoku. Headquartered in Kure, Hiroshima Prefecture, BCOF was primarily involved with demilitarisation and the dismantling of Japan’s military industrial capacity. It fell to Royal Australian Navy Captain H. J. Buchanan to lead the first Commonwealth military delegation to set foot on Japanese soil and accept the keys to Yokosuka naval base on August 30, 1945. Subsequently somewhat overshadowed by Gen. Douglas MacArthur’s arrival at Atsugi that very same day, this poignant moment was recorded for posterity (See Early SDF History page). In the case of Iwakuni, it was the Royal Australian Air Force (RAAF) that played a major role in what were known as BCAIR operations; Iwakuni was designated as an RAAF base from March 1948 to 1952.
number from the resident No. 381 Base Squadron, J. R. Kinninmont. 1947. An informal portrait of the Williams brothers—Venn (left) and Cliff—flight lieutenants who flew Mustangs with No. 82 (Fighter) Squadron, BCOF. home when placed on combat standby on June 25. Flying the first combat mission by a non-U.S.
Gloster Meteor F.8 in early April 1951. Soldiers from British troop units wait to board a Korea-bound Douglas C-47 Dakota aircraft of No. 30 Transport Squadron. The RAAF retained a transport unit at Iwakuni until 1955. August 10, 1953. Group Captain Alan Burnard is on the left of this informal group portrait of members of No. 391 (Base) Squadron, standing in front of an air movement status board at Iwakuni. During the Korean War, Short Sunderland Mk.V aircraft from the Royal Air Force (RAF), which had formed a three-squadron Far East Flying Boat Wing (FEFBW) in Singapore in 1950, were stationed on rotational detachment at Iwakuni; the last detachment came to an end on July 31, 1953. The FEFBW was the only RAF unit that participated in missions over Korea. In his book, Sunderland over Far-Eastern Skies (Pen & Sword, 2010), Group Captain Derek L. Empson provides details of the maritime reconnaissance missions conducted in support of a UN blockade of North Korea. His account also provides and an insight into off-duty life in what was then a small town during his time as a navigator with the then rank of flight lieutenant. Arriving for the first of his five-week tours of duty in late March 1953, the principal operations fell into three categories: air surveillance patrols; shipping surveillance patrols along set tracks over the Yellow Sea that lasted up to 13 hours; and weather data gathering off the Chinese coast. Pre-planned and tasked by the U.S. Navy under the UN mandate, missions were flown daily throughout the war, and also during the Armistice period that followed, until September 1954. Links to three photos of RAF Sunderland Mk.Vs moored off Iwakuni are included here: in October 1950 [link]; a close-up of No. 209 Sqn’s ‘C’ Charlie taken in 1951 [link]; and a fine shot of EJ155:‘D’ Dog of No. 88 Sqn [link]. No. 14 Squadron RNZAF was stationed at Iwakuni from late March 1946 to February 1948. An excellent illustrated account of the FG-1D Corsair-equipped unit’s sea journey to and time in Japan can be found here [link]. Of note is the contrast between the photos of the cannibalized hangars at Iwakuni and the new No. 14 Squadron HQ, paid for by the Japanese government as part of its war reparations. The website of the 656 Squadron Association also offers two excellent aerial views (Photos 012 and 013) of Iwakuni and one of the U.S. Navy/RAF flying boat base (Photo 017), circa 1953 [link]. Iwakuni’s association with flying boats briefly extended to civil operations. Following a route proving flight that departed London on November 24, 1947, the base received British Overseas Airways Corporation (BOAC) Plymouth-class Short Sandringham flying boat services, an extension of the Hong Kong route, from March 1948. These were curtailed in the course of 1949, but other carriers resumed international services in earnest from 1952. Returning to Iwakuni’s formative years, the construction of the IJNAF airfield was commenced in April 1938, nine months after the start of the Second Sino-Japanese War (1937–45). Prior to the acquisition of the land by the Japanese government, Iwakuni was a river delta area made up of agricultural land and hamlets. A training unit assigned to the Kure Naval Depot having arrived in December 1939, the flight training elements of the Iwakuni Naval Air Group officially took up residence and were declared fully operational on July 8, 1940. At the start of the Pacific War in December 1941, 3,000-strong Iwakuni was a dual-function training and defence base that was home to 96 student pilots and 120 Zero fighters. The base’s scope was expanded by the opening of the 1,000-cadet Iwakuni branch of the Etajima Naval Academy in September 1943. During 1945, the facilities at Iwakuni were subjected to strafing attacks primarily carried out by U.S. and British aircraft and two B-29 air raids, on May 10 and August 14, the latter being the day before Japan surrendered. Already developed as a major gateway during the Korean War campaign, Iwakuni’s facilities were extensively renovated prior to the U.S. Air Force (USAF) assuming control from the RAAF on April 1, 1952, under an agreement between the Japanese government and the UN. Having also become home to the U.S. Navy’s Fleet Air Wing 6 on October 1, 1954, Iwakuni witnessed the relocation from South Korea headquarters of the 1st Marine Air Wing (MAW), which took up residence in July 1956. 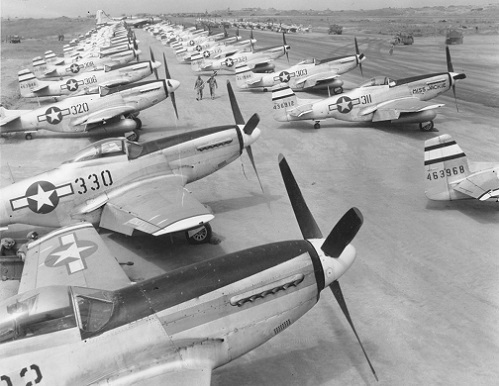 The north side of the airfield was expanded to accommodate the MAW’s total complement of around 2,500 personnel. On January 1, 1958, Iwakuni finally passed from USAF hands and was redesignated a Marine Corps Air Facility, around four and a half years before Marine Corps Air Station (MCAS) status was bestowed. In terms of overall command from the Japanese side, Iwakuni was initially a joint operation between the JASDF and USAF from March 1957. It was not until June 1969 that the JMSDF took over the reins for the second and final time. The complex ebbs and flows of the SDF presence during the 50s and 60s are best set in chronological order in tabular form, as follows. 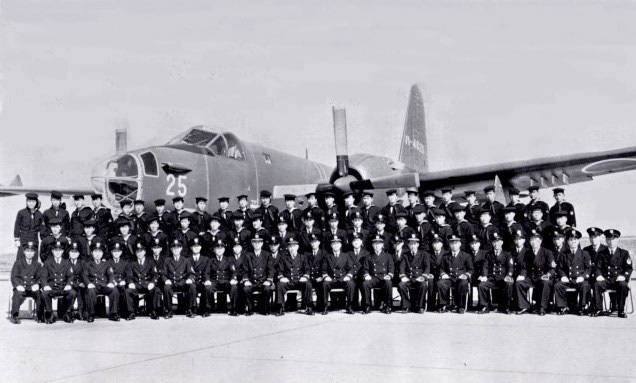 At the base level, joint flight operations commenced in October 1954 and were continued by the formation of a JMSDF Iwakuni Air Training Detachment flying Beech SNB/JRB-4 Expeditors in March 1957, this unit being elevated to Air Training Squadron status on February 1, 1958. Formed in June 1968, an Iwakuni Air Detachment was disbanded in March 1983. The base’s long association with aircraft made by ShinMaywa (formerly Shin Meiwa) commenced with the formation, on March 1, 1973, of the 31st Fleet Air Squadron on the PS-1 anti-submarine warfare (ASW) flying boat under the 31st Fleet Air Wing. In September 2013, a special issue of stamps went on sale at post offices in Iwakuni and surrounding areas to mark the 31st Fleet Air Wing’s 40th anniversary. A replica Mitsubishi Type 0 Carrier Fighter is parked in front of the shrapnel-scarred Zero Hangar at MCAS Iwakuni in May 1993. Located across the street from the base Provost Marshal’s Office, the hangar is one of the last vestiges of the base’s original residents. The major undertaking in a project first announced in 1992, reclamation work designed to reposition Iwakuni’s runway half a mile (one kilometre) offshore was started in 1997. The ultimate aims being to reduce noise levels in the local community and increase safety, landfill material from nearby Mt. Atago was carried three miles (4.8 km) by conveyor to barges. Completed in March 2010, the new runway entered operation two months later. An aerial view of Iwakuni runway in 1996, before the start of reclamation and runway relocation work. December 13, 2012, saw the official opening of Kintaiko Airport, named after the bridge that is a local landmark, 48 years after the end of a brief three-year period of civil airline services in August 1964. Iwakuni has thus joined the ranks of SDF bases that are co-located with airline operations. Iwakuni before and after completion of Iwakuni-Kintaikyo Airport. The shot above was taken from the window of a passing JAL flight in February 2007, that below in January 2013, the month after the airport’s official opening. Dwarfed by one of Iwakuni’s cavernous hangars, members of the 31st Fleet Air Wing await the start of the traditional formalities for the first flight training missions of the year on January 7, 2015. The representative aircraft from each unit assigned to the year’s first flight training mission are ceremonially taxied past their respective hangars as they set off to the takeoff point. Mission accomplished. Having negotiated the slipway at Iwakuni (above), the US-2 crew that took part in the first flight of 2015 heads back toward the hangars (below). Another of the regular events in life at Iwakuni is the return of an Agusta-Westland CH-101 helicopter after an extended period of service aboard the Yokosuka-based Antarctic research icebreaker Shirase. Taken at one such event in April 2013, the two photos shown give some idea of its ceremonial aspect (above) and the rapturous welcome that is extended to the crew members (below). event, held on May 3, 2015. Line 山陽本線 (JR West), around 10 minutes by bus/taxi to base. Belying its size—a land area of a mere eight square miles (21km2)—Iwo To’s importance in terms of aviation was borne out of its geographical location and the presence of ready-made airfields. This fateful combination placed the island firmly in the sights of USAAF 20th Air Force military planners looking for suitable emergency strips ahead of B-29 operations against mainland Japan in 1945. In mid-1944, as part of the military buildup, Japan enhanced the two IJNAF airfields (Chishima and Motoyama) and the IJAAF facility (Kita [North] airfield) that had been completed in 1933 and made operational over the following four years (see Note 1). The first of the Pacific War to be fought on Japanese soil, the ensuing Battle of Iwo Jima— as it will forever be known outside Japan—was to rage over an horrific 36-day period from February to March 1945. Motoyama No. 1’s three intersecting runways were used by Japanese fighter and reconnaissance units right up until February 19, the day of the invasion. 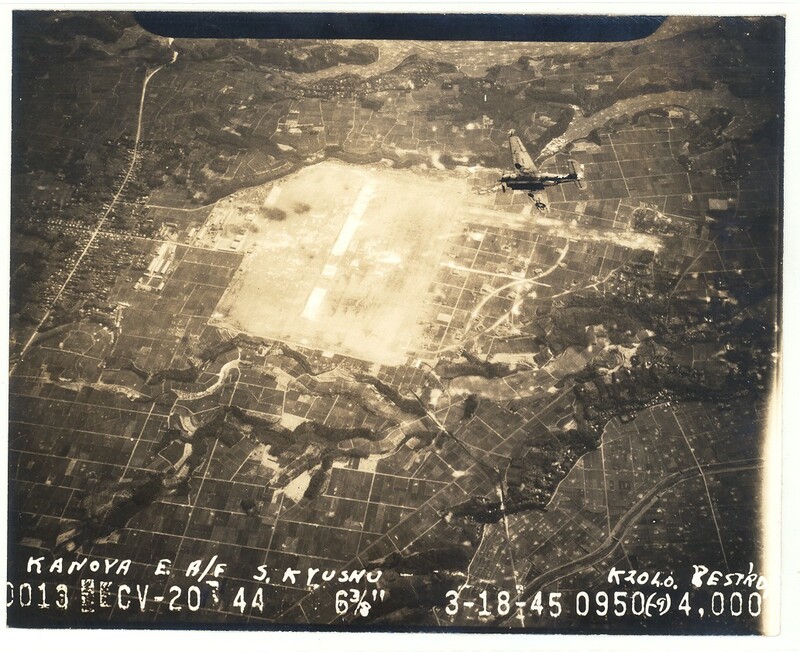 A week later, the airfield was being made ready for use by U.S. Marine Corps observation aircraft, despite the ongoing threat from Japanese forces. Renamed Central Field on March 1, it was here that the first flak-damaged B-29 landed, on March 4, 1945. The first of two parallel runways at Central Field was declared operational on March 16, 1945. Both were progressively extended to accommodate B-29 operations, while the Japanese-built airstrip running east to west served as a refuelling stop. Home primarily to 20th Air Force fighter, night fighter and reconnaissance units up to December 1945, Central Field became a refuelling stop for Military Air Transport Service (MATS) and support units four months after the cessation of hostilities. Handed back to Japanese administration on June 27, 1968, part of what was once Central Field now forms JMSDF Iwo To Air Station. Central and North airfields, as they appeared after the war in 1945. Abandoned after the war, Kita airfield (see Note 2) was for a time used as a storage facility. (Note 1) Confusingly, or perhaps a deliberate attempt at deception on the part of the Japanese military, Chishima was also the name of the administrative province that covered part of the Kuril islands off Hokkaido in northern Japan; the province’s four southernmost islands remain the subject of a territorial dispute with Russia. Despite its name, there was also a Kita (North) airfield located near the village of Yomitan in the southernmost prefecture of Okinawa. Located close to Kadena AB, traces of Kita (Yomitan) airfield remain to this day [link]. Finally, the kanji for Motoyama can also be read Genzan, the Japanese name for Wonsan (today in North Korea), from where the Zero-equipped Genzan Naval Air Group operated. (Note 2) Again confusingly, some sources refer to Kita airfield as Motoyama No. 3. The JMSDF base was established on Iwo To after its return to Japanese administration in 1968, and the 4th Fleet Air Wing then based at Shimofusa in Chiba Prefecture charged with forming the Iwo To Air Station Detachment. In March 1982, the service added the Iwo To Air Rescue Flight. Making use of the geothermal power available on (or rather under) their doorsteps, JMSDF facilities today cover around 43% of Iwo To’s land area. Having also established an air base on the island in January 1984, the JASDF formed the Provisional Drone Operation Unit under the Iwo To Base Squadron in March 1992. The squadron was re-designated as a detachment the following month, in April 1992, the provisional unit being officially renamed the Iwo To Drone Operation Flight in March 1994. The aircraft most closely associated with the JASDF operation on Iwo To were the 12 F-104J Starfighters converted to UF-104JA (and two to interim UF-104J) target drones. The last Starfighters in JASDF service, the first was shot down in March 1995, the last two years later. Ordered for modification by Mitsubishi in 1988 and designed to be flyable by a pilot or remotely, the first two QF-104Js were completed late in 1989. The first of the two aircraft flew from Nagoya/Komaki AB late on December 18 that year. After delivery, these aircraft were tested over the course of 147 sorties by the Air Development & Test Wing (ADTW) at Gifu up until 1992. The milestone of the first remotely controlled landing in full drone configuration was achieved during operational service trials conducted in October 1991. One of the two UF-104Js in flight over Iwo To. When funding was secured for six aircraft, the designation was changed from QF-104J to UF-104J and the production drones, as opposed to the test aircraft, designated UF-104JA. The two test aircraft were handed over to the Provisional Drone Operation Unit in March 1992, and the unit received all six ’JAs of the first batch during the course of fiscal 1993. An order for a further batch of six aircraft followed late in 1994. Two excellent videos on YouTube show the two UF-104Js during testing. The first covers a manned test flight [link], the second a remote flight from a ground station with a manned chase aircraft [link]. Staying on the subject of pilotless aircraft, Iwo To was also used during recovery tests of the air-launched Improved TACOM UAV. The first autonomous landing on the base’s single main runway, which is 8,700 feet (2,650 metres) long and 200 feet (60 metres) wide, took place on December 15, 2009. (See the JASDF Aircraft Programmes page). Of equal length, the 100-foot (30 metre) wide parallel taxiway can serve as a runway in an emergency. On a visit to Washington D.C. in January 1983, the then Japanese Prime Minister Yasuhiro Nakasone (1918–) famously pledged to assist U.S. defence policy by making Japan an “unsinkable aircraft carrier in the Pacific”, a term that had originally been applied to the island of Saipan during the Pacific War. Since 1989, the tiny expanse of Iwo To has essentially served as a rock-solid aircraft carrier by hosting regular field carrier landing practice (FCLP) exercises for U. S. Navy fighter units shore-based at Atsugi, Kanagawa Prefecture. Since the first night landing practice (NLP) was held in 1991, more than 95% of such training has also been conducted on Iwo To, where the runway features a mockup of a carrier deck expressly for the purpose. Such occasions are one of the few times that Iwo To Air Station opens its doors to civilians. Aside from civilian contractors or veterans returning to pay their respects at memorials to those who fell in 1945, the base remains off limits to unauthorized personnel. In June 2013, the Kanagawa Prefecture politician Hideshi Suzuki was among a group of former Internal Affairs Standing Committee members and people from the Atsugi base area whom the U.S. Navy flew down to Iwo To in order to witness an FCLP exercise. Although the people living in the vicinity of Atsugi had not been subjected to the noise generated by NLP since May 2007, operational delays had resulted in an increased amount of daytime training in May 2012. The account on Hideshi Suzuki’s Japanese website [link] includes some photos of the Iwo To Air Station and war memorials. A “temporary” solution since its inception, the U.S. Navy’s utilization of Iwo To has removed around 150 hours of excessive noise pollution from around Atsugi, from where the fighter units are due to relocate to Iwakuni in 2017. In 2014, the Japanese government accelerated efforts to conduct an environmental survey of an alternative island location, Mageshima, off the south coast of Kyushu and administered by Kagoshima Prefecture. From the U.S. Navy standpoint, that would bring an end to the major downsides of flying from Iwo To, namely the unpredictable tropical weather conditions and the lack of a nearby diversionary airfield. In November 2014, a Delta Airlines Boeing 757 diverted to Iwo To after an engine shutdown when en route from Kansai Airport to Guam. The respective SDF elements are also well positioned to coordinate and provide rescue services throughout the Ogasawara island chain, from the airlift of patients requiring urgent medical attention to, should the need ever arise, the supply of disaster relief. The opening of the newly completed base at Kanoya, which was to be utilized throughout the Pacific War, coincided with the formation of its first resident unit, the Kanoya Naval Air Group, on April 1, 1936. On August 12, 1937, just over a month after what is termed the Marco Polo Bridge Incident had sparked the Second Sino-Japanese War (1937–1945), the Kanoya Naval Air Group was deployed to Taiwan and subsequently saw extensive combat service on the Chinese mainland until 1941. As such, the first unit to bear the Kanoya Naval Air Group name only remained active until about a year into the Pacific War. Initially, the unit operated land-based bombers and carrier-based fighters in the training role. However, half the land-based bomber complement was deployed to French-Indochina immediately before the outbreak of hostilities and took part in the operation against the Royal Navy battelships, HMS Prince of Wales and HMS Repulse, off the coast of what was then Malaya on December 10, 1941. The Kanoya Naval Air Group was re-designated as the bomber-equipped 751st Naval Air Group on October 1, 1942, and soon thereafter deployed to Kavieng airfield on New Ireland (now a province of Papua New Guinea). Having suffered heavy losses in the Solomon Islands theatre of operations and during the Battle of the Philippine Sea of June 19–20, 1944, the unit was finally disbanded as the 701st Naval Air Group in July 1944 in the Mariana Islands. In the meantime, a second version of the Kanoya Naval Air Group, tasked with the training of carrier-borne attack aircraft and bomber crews, became the base’s main tenant on October 1, 1942. Having switched to the training of land-based attack aircraft crews in February 1944, the unit was to remain at Kanoya until the deteriorating war situation and the presence of front-line units forced a relocation to Toyohashi in Aichi Prefecture; what was actually the second Toyohashi Naval Air Group formed on July 10, 1944. Providing training for aircraft armourers who by that stage of the war were being recruited in their teens, a unit called the Second Kanoya Naval Air Group was operational from February 1, 1944, to June 30, 1945. One of the 828 young airmen to depart from Kanoya during its time as a kamikaze attack base, former professional baseball player Shinichi Ishimaru (1922–1945) pauses to have his photo taken next to the cockpit of a Zero fighter; his flying suit bears his family name. Originally exempt from military service as a professional baseball player, as an evening law school student he signed up for Navy flight school in a student recruitment drive in the spring of 1944. Assigned to Tsukuba Naval Air Group as a student pilot, Ishimaru reportedly volunteered to join a kamikaze unit and was sent to Kanoya for training. Ishimaru’s aircraft was shot down by U.S. fighters when en route to Okinawa on May 11, 1945. Kanoya was built up as the primary and largest base for the mounting of “special attack” (kamikaze) missions under the command of the Fifth Air Fleet Headquarters. Equipped with Mitsubishi G4M Betty bombers and Kugisho MXY7 Ohka (Cherry Blossom) special attack aircraft, the first detachment from the 711th Naval Air Group moved forward from Konoike air base in Ibaraki Prefecture to Kanoya on January 20, 1945. 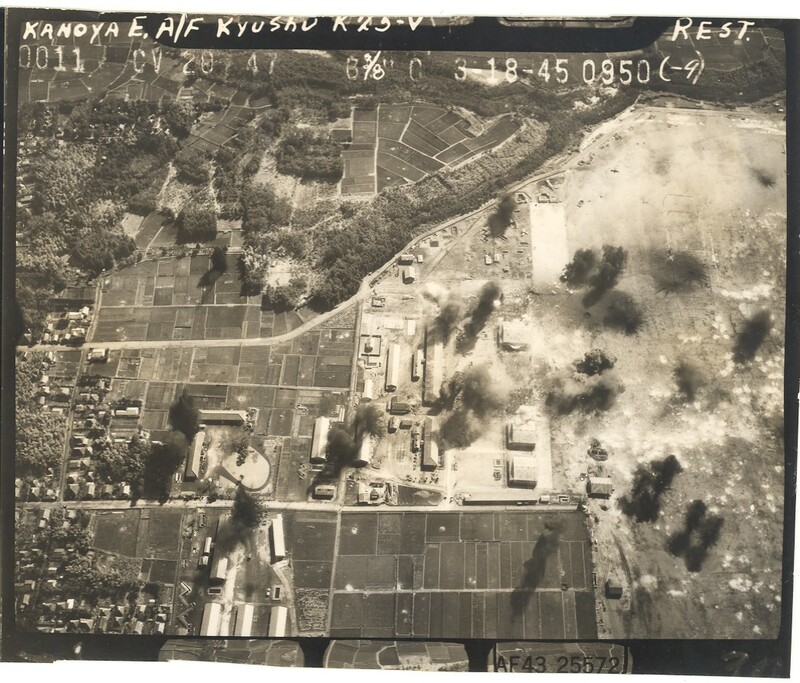 Following the end of hostilities, Kanoya was occupied by U.S. forces in September 1945, the IJNAF’s Fifth Air Fleet making way for the USAAF’s Fifth Air Force. The U.S. forces pulled out in November 1948, at which time the base came under the temporary control of Japan’s Finance Ministry. The base became home to a National Police Reserve garrison in December 1950, four months after that organization’s establishment, and then to the 12th Regiment of the now National Safety Force (NSF)’s Kanoya garrison in 1952. The latter was disbanded in December 1953, when an aviation element of the Coastal Safety Force, initially equipped with T-34A Mentor training aircraft, took up residence and was to prove the harbinger of Kanoya’s return to a full-fledged air base under the JMSDF. 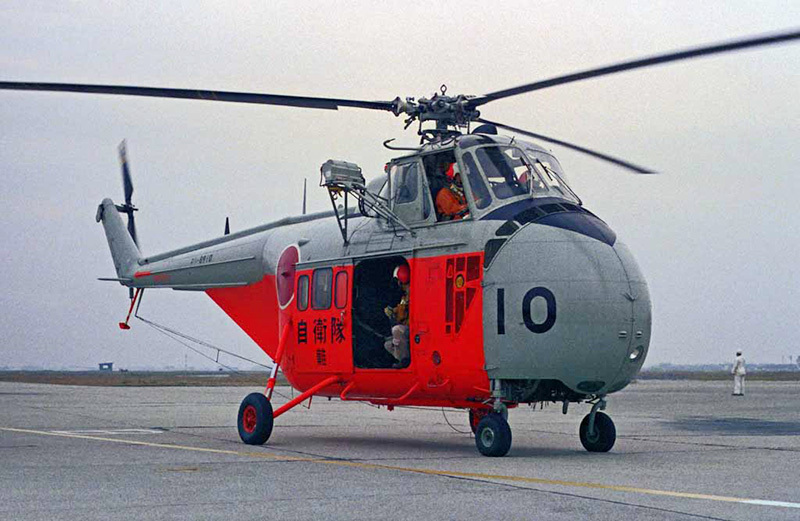 Aside from the base nomenclature, the organizational changes brought about by the JMSDF’s inception on July 1, 1954, resulted in the Coastal Safety Force Kanoya Air Corps being renamed the JMSDF Kanoya Kōkūtai (Air Corps). A short-lived JGSDF garrison was dispersed to other facilities within Kagoshima Prefecture in November 1955. Kanoya was progressively developed as the training centre for the JMSDF’s fixed-wing operations. Formed in November 1954, the 1st, 2nd and 3rd Hikōtai (flights) of the Kanoya Air Corps were joined by the 4th and 5th in January 1955. The expansion led first to the formation of the 2nd Kanoya Air Corps in December 1955 and then its relocation to Ohminato a year later, in December 1956. The standing up of the 6th Hikōtai and the disbandment of both the 3rd and 4th in May and July 1957, respectively, were followed in April 1958 by the formation of the Kanoya Air Training Corps, at which time the 6th was redesignated as the 21st Hikōtai and transferred to Tokushima. The Kanoya Base Rescue Flight was formed in December 1960. Kanoya will be familiar to many as the location, albeit not very easily accessible, of the excellent JMSDF Aviation Museum. Alongside the JMSDF exhibits, the museum serves as the repository for poignant portraits of some of the, by its count, 908 airmen who set off on kamikaze missions from the base. 1st Fleet Air Wing HQ in around 2010 (below). In June 2015, however, heavy equipment was brought in to demolish the historically significant former Kanoya Naval Air Group headquarters. In the 70th anniversary year of the end of the Pacific War, the very building where a conference was held in February 1941 and the plans hatched for the earth-shattering Pearl Harbour attack is being torn down, reportedly [link] because the structure no longer complies with earthquake resistance standards. Having amazingly survived the onslaught unleashed against Kanoya base in 1945 and been used as the HQ of the 1st Fleet Air Wing since September 1961, the 79-year-old building will finally be razed to the ground. Photographed at the annual Air Memorial in Kanoya air show in April 2015, its replacement [below] does show some resemblance to its predecessor. The new 1st Fleet Air Wing HQ building was declared operational in June 2015. It will be from this building that plans for Kanoya’s modern-day commitment to security will be formulated. These plans will include the base’s occasional but ongoing involvement in anti-piracy deployments off the coast of Somalia and over the Gulf of Aden. In 2014, the 16th such deployment was the fourth to involve Kanoya-based aircraft. Two P-3Cs departed from Kanoya on June 9, conducted shipping surveillance operations in very demanding climatic conditions and returned on October 17. Of the total of 190 personnel in the contingent, the JMSDF accounted for around 120, and the remaining 70 were from the JGSDF. Although the base maintains its own low-key but poignant memorial, somewhat more imposing is a memorial tower dedicated to those who gave their lives on one-way missions from Kanoya. A Japanese website offers some images of the memorial, which is located in in Kozuka Park in the Imasaka area of the city [link]. Mentioned in the caption for the Type 95 trainer at the start of this section, the memorial was erected to worship the spirits of the fallen in the Imasaka area of Kanoya on March 20, 1958. (The memorial is now located in Kozuka Park, close to Nishiharadai Elementary School.) Placed atop the 36-feet (11-metre) high memorial sits the international peace symbol of a white dove, wings outstretched, facing towards the southern sea skies. The tower’s nameplate bears the names and kamikaze unit names as well as the mission dates and numbers of the 908 killed in action. 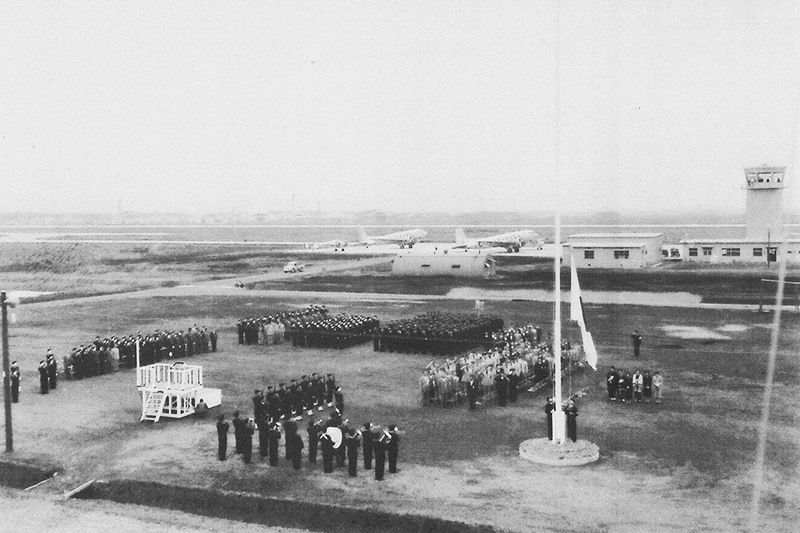 Granted city status in May 1941, Kanoya holds a memorial service in April every year, for which the First Fleet Air Wing provides the honour guard and music as well as a P-3C flypast; hence the air show event being named the Air Memorial in Kanoya. * Purporting to show Shinichi Ishimaru in 1945, a suspiciously modern-looking photo on Wikimedia Commons [link] appears to be of the actor Toshihide Tonesaku, who played Ishimaru in the 1996 film Ningen no Tsubasa (Wings of a Man). The film was based on the 1994 novel Kieta Haru (Vanished Spring) by Hidehiko Ushijima (1935–1999). These shots allow a bird’s eye view of the changes made to Shimofusa over the course of 20 years. Both looking east, the photo above was taken in 1989, that below in August 2009. (Above and below) Tateyama as it looked on December 2, 1954, when a ceremony was held to mark the official handover of 22 aircraft, including 10 Grumman TBM-3W2 Avengers destined to be based at Kanoya in Kagoshima Prefecture. These photos are taken from the April 1955 issue of The World’s Aircraft, a magazine that ceased publication after six years in 1957; another photo from that day appears on the SDF Chronology page.